Versa-Matic’s E1 1″ air operated diaphragm pump uses the Elima-Matic air valve system to provide non-stalling, lube-free performance. 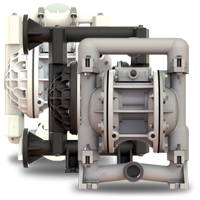 The E1 1″ plastic air operated diaphragm pump comes in optional and standard porting models, and offers a flow rate of 0-35 gpm. Click here for E1 detailed specifications. Click here for E1 brochure.